Having a sick baby isn't any fun for anyone. Being able to take their temperature can often prove to be a difficult task, but it's important to know exactly how sick baby is. I know how frustrating and complicated it can be to get an accurate temperature reading when you're dealing with a sick infant or toddler. So many thermometers are slow and inaccurate, which often leads to cranky children (and parents). Have you hear about the Vicks Behind Ear Thermometer? Simply touch the thermometer in the hollow behind your child's ear, which is the ideal external site to measure temperature. In just one second, you'll have an accurate temperature reading and know whether your child has a fever or not. 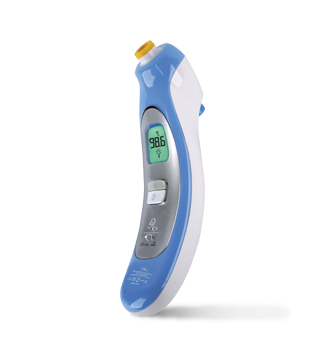 This fabulous thermometer lets you take your child's temperature without incident, just point and click, it's that easy! This thermometer is super easy to use and gives you an instant and accurate reading. The thing that I love most is that I can quickly and easily take my children's temperature - anytime, anywhere! Whether they are asleep or awake. This gives me added security and peace of mind, especially while my sick babies are sleeping! Whether your children are newborns, toddlers are school-aged - this thermometer is a must have for any parent! The Vicks Behind Ear Thermometer provides convenience, accuracy in a trauma-free, parent tested and FDA approved thermometer. Disclaimer: I received a complimentary Vicks Behind Ear Thermometer for the purpose of writing a review and hosting a giveaway. Regardless, I only recommend products or services I use personally and/or believe will be a good fit for my readers. The views and opinions expressed on this blog are purely my own. Results may vary. No monetary compensation was received. I learned that it is clinically proven accurate. I learned it displays if there is no feet, a slit fear, or a fever. I love its so fast and easy you don't have to wake up the child to take their temp. I learned I can buy it at Target. learned Memory system—Tracks and saves the last 8 measurements. I learned that it's very accurate. I learned that their new thermometer lets you get a quick temperature reading from behind your child's ear, close to the carotid artery, which is the ideal external site to measure temperature. I learned a green display means no fever and a red display means fever. I learned it works in 1 second and it remembers the last 8 temps taken. Best of all no crying baby.Thanks for the giveaway! I learned about the color coded display- A GREEN display means no fever. I learned that there is a one second reading. Wow - an accurate 1 second reading! Awesome! Tells you whether the baby has a fever or not. Love that it is accurate in only 1 second! I learned the reason it is good to take the temperature behind the ear is that is close to the carotid artery, which is the ideal external site to measure temperature. Fever InSight helps you understand the meaning of temperature readings using a color-coded display. I learned that I can buy it at Wal-Mart or target. I learned that you can get accurate results in 1 second! "Simply touch the thermometer in the hollow behind your child's ear, which is the ideal external site to measure temperature." I learned the Vicks V980 has a lifetime warranty! laying — use the opposite side. I learned that it takes just ONE SECOND to get the reading! Thats amazing! I learned that it only takes one second to get the reading. That is incredible! Learned that it is so gentle, 95% of babies in a daycare study slept right through measurement. gentle and accurate. thank you! i learned that this comes with a lifetime warranty! 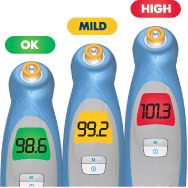 I learned it has FeverInsight technology and uses color coding to tell you whether they have a fever. I learned that it tracks and saves the last 8 measurements. It takes just 1 second to get a reading!!! i learned that it is clinically proven accurate! I learned that the carotid artery is the ideal external site to measure temperature. has fever insight that helps determine what a temperature is! That it only takes a touch with this thermometer for an accurate reading! It's a great product! I learned that it's sold at Target and Rite Aid. It is so gentle, 95% of babies in a daycare study slept right through measurement. It tracks and saves the last 8 readings! Simply touch the thermometer in the hollow behind your child's ear, which is the ideal external site to measure temperature. In just one second, you'll have an accurate temperature reading and know whether your child has a fever or not. I learned about its Memory system—Tracks and saves the last 8 measurements. Just takes 3 easy steps!